CENTENARY — Students at Gallia Academy High School met with Laura Saunders of Wing Haven on Thursday to learn about career opportunities. Saunders is a career counseling specialist at Wing Haven, which offers counseling services. “My goal is to help people learn what their strengths are, and help connect them with a career that is best for their personality,” stated Saunders. She worked with students exploring their personality traits and discussing what career fields are best suited for them. Students took a quiz to learn what their personality type is and discussed how different jobs are better suited for different personalities. “I try to help equip people with tools to gain employment,” said Saunders. The Ohio Means Jobs website has resources for students to find scholarships based on their intended school and current GPA, information regarding career fields, and income information, all of which is free to the public. Saunders introduced these resources to students to help equip them for furthering their education. Saunders normally spends her time doing workshops at the Department of Job and Family Services that help individuals develop basic job skills, writing resumes and filling out job applications, and guiding them through the career process. She also does individual counseling at Wing Haven in Vinton. “I work with people to help them earn their own income and be successful” said Saunders. She works with students in high school and persons later in life trying to gain employment after struggling with addiction. To learn more about Wing Haven visit winghaven.org to see the extent of their services. To learn about the online resources with Ohio Means Jobs, visit ohiomeansjobs.org. 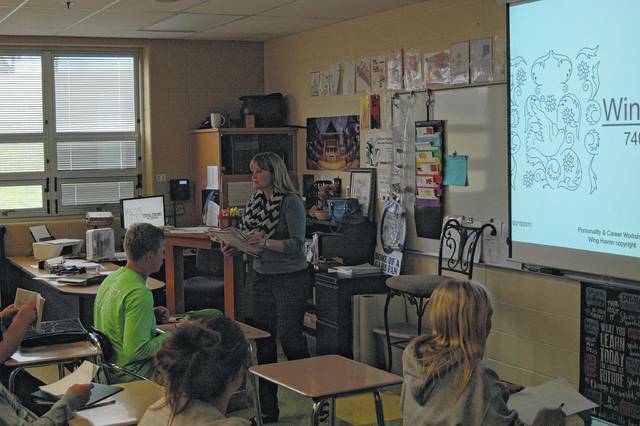 Laura Saunders spoke to students at Gallia Academy Thursday about preparing for life after high school. Reach Morgan McKinniss at 740-446-2342 ext 2108 or mmckinniss@aimmediamidwest.com.